Don’t tell Donald Trump, but Chicago’s infamous “cemetery vote” just ain’t what it used to be. Trump has openly questioned the integrity of the upcoming presidential vote, pointedly citing Chicago as a city with a very checkered electoral past. But is Chicago merely paying for the sins of the past, rather than present day chicanery? Indeed, just as the one-time might of Chicago’s Democratic machine is largely a relic of the history books, good old fashioned vote-stealing in Chicago has not been documented for decades. For weeks, workers at both the Chicago and Cook County election boards have been preparing machines and software for the upcoming votes. At a warehouse on Pershing Road, NBC 5 Investigates watched as Chicago technicians tested the city’s machines and prepared them for shipment. Each machine was checked to make certain that screens worked, scanners scanned, and paper magazines were loaded and ready. And that no votes were pre-stored in memory. To make certain of that, memory packs are secured inside the machines behind doors with numbered seals. And each machine produces what is called a “zero tape” when it is switched on election morning, to demonstrate that no candidates have any votes when the day begins. That same tape backup rolls off a copy every time someone votes. Orr noted that one of the greatest safeguards against allegations of Democratic tampering, is the vigilance of the opposition. “Everything we’re trying to do is transparent,” he said. “We have thousands of Republican judges--- they set up the equipment. They’re there. And they don’t buy all that stuff." And those dead voters who made Chicago so famous? It’s not confined to Chicago. The Pew Charitable Trust estimated earlier this year that nearly two million dead voters are still listed on the rolls nationwide. 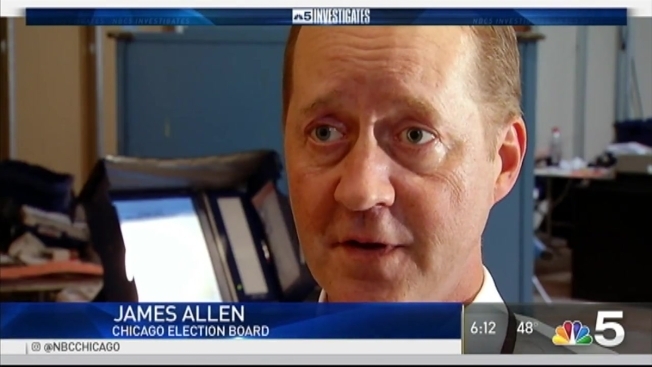 Chicago election board officials insist they are doing everything they can to maintain rosters with only living, breathing voters. Officials insist that when someone does slip through the cracks, it usually isn’t because of real fraud. In some cases, experts note, widows sometimes vote recently deceased husbands’ absentee ballots, suggesting “that’s what he would have wanted”. Not with ill intent, but without knowing it’s not allowed. Orr noted that there have also been documented cases of citizens taking part in the early voting process, then dying before election day.